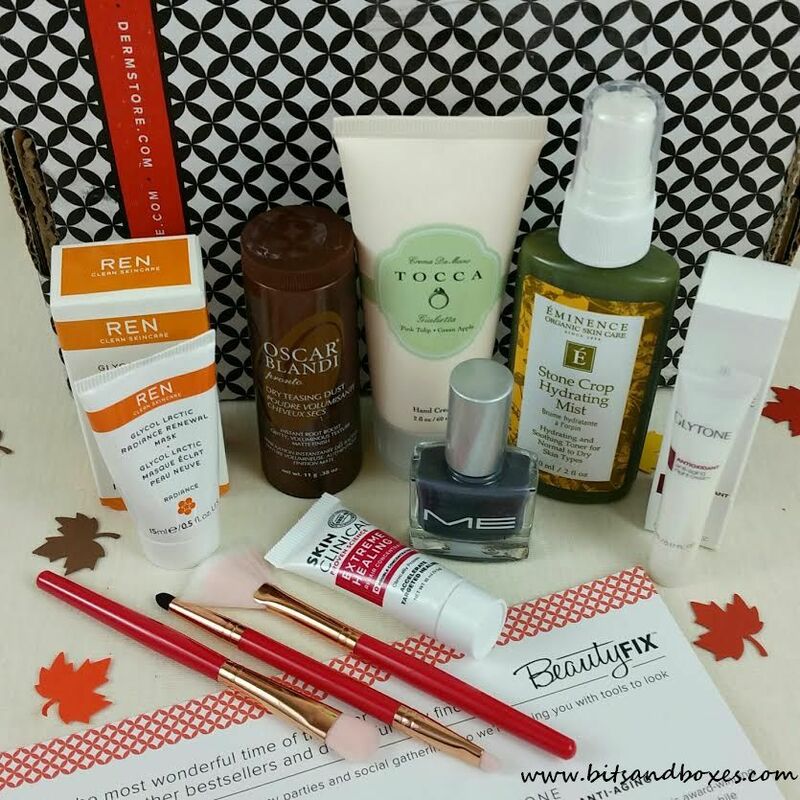 BeautyFix by Dermstore definitely appeals to a certain kind of person. I know this because I am that person. I love getting skincare, especially good quality products and BeautyFix tends to always have the goods when it comes to skin. If you're looking for makeup... this is not for you. Yes, there is occasionally makeup but not much. 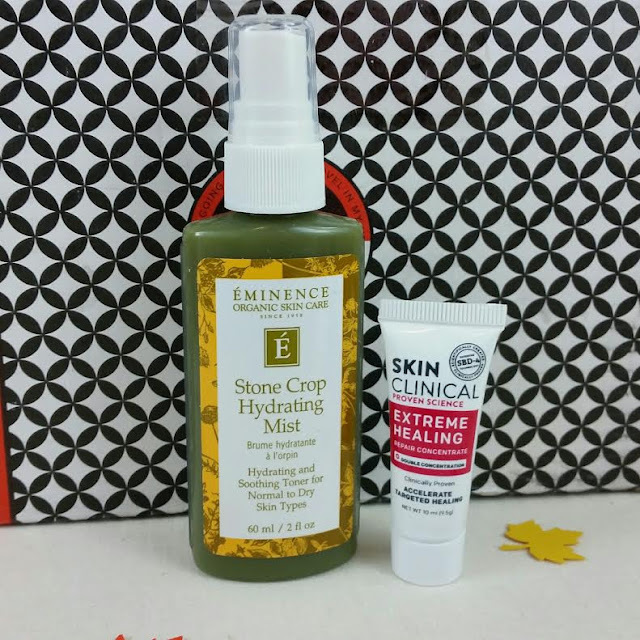 Eminence Organics Stone Crop Hydrating Mist- This is a strange product. It's made of Stonecrop juice, water and salicylic acid. I grow stonecrop in my garden. It's a sedum that spreads really quickly and there are a million different kinds but none of them seem to have any scientific use in skincare. In fact, if you look it up, only Eminence appears to use it. They consider it hydrating. Really, the only benefit is the salicylic acid which is a BHA exfoliant. It's good at breaking down lipids and oils and is also an anti-inflammatory but you can get that much more affordable brand. SkinClinical Extreme Healing Repair Concentrate- This is touted to bring relief to severely dry, delicate, itchy, red, inflamed, wounded, scarred or chapped skin. I don't see anything ridiculously amazing in the ingredients list. It's got avocado oil, shea butter and a coconut oil derivative in it. An antioxidant or two but that's about it. Serviceable but not special. Oscar Blandi Dry Teasing Dust- This professes to provide an instant root boost with a matte finish. It's in a shaker like... baby powder. I am not powdering my hair. I don't even need to try this to know that on my dark hair, I don't care what they say, this is going to show up as flakes. Gross. 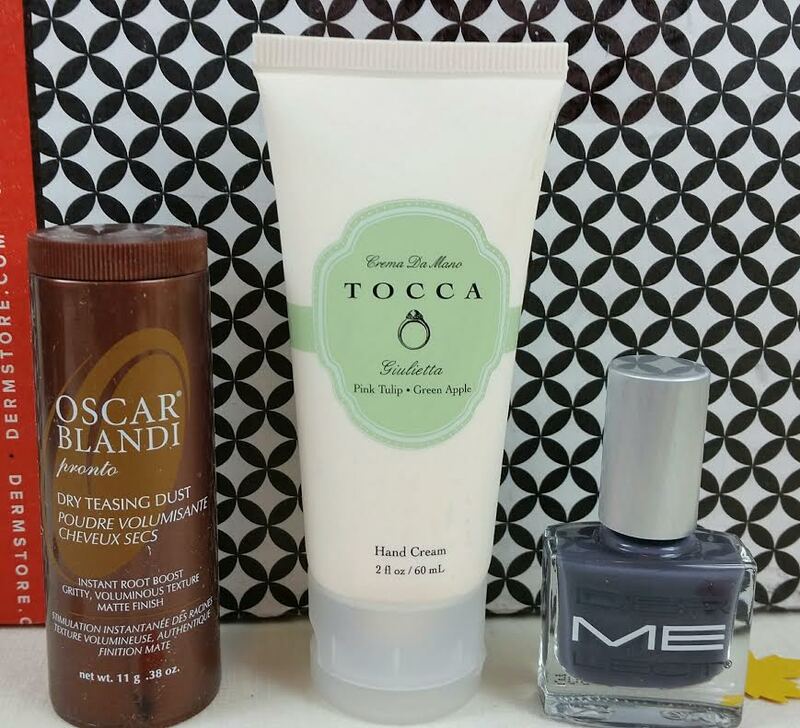 Tocca Hand Cream in Pink Tulip Green Apple- I'm so happy I finally got a Tocca hand cream that I can use! Hooray for no lavender! Coconut oil, shea butter and aloe gives you nice soft hands. DermElect ME Nail Polish in Excentric- Hopefully that's a spelling error on purpose. This is a gray. I feel like it's slightly blue but only in certain light. The formula is thick and its almost opque in one coat. 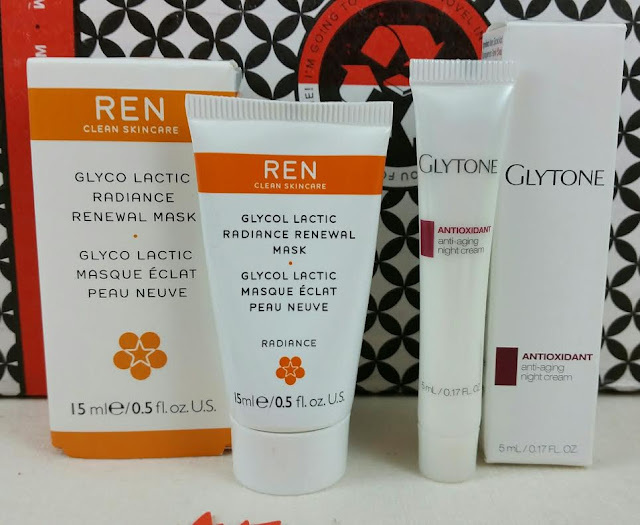 Ren Clean Skincare Glyco Lactic Radiance Renewal Mask- What a mouthful! This has lactic acid which is an AHA, a bunch of oils for moisturizing and tons of fruit extracts. It also has some citrus oils that you may need to avoid if you have sensitive skin. Essential oils can be really irritating for some skin types. I've cut them out as much as possible to see if it helped minimize redness. I also cut out alcohol in my skincare and starting heavily moisturizing. Since I did all those things, the redness in my skin has been nearly eliminated. It's made a HUGE difference. The only thing is I don't know if it was all those things or just one or two of them and I'm afraid to do testing in case I ruin the good thing I have going. I might try patch testing this just to see since there is so much citrus in it. I don't want to slather it on then leave it for ten minutes then turn into a blazing scarlet poppy. Hah! Glytone Antioxidant Anti-Aging Cream- I really like Glytone. Glycolic Acid is great for non-abrasive exfoliation. Who doesn't want all those dead skin cells gone and the new bright ones underneath to show? This night cream also has peptides which might help strengthen skin barriers and thus keep sagging away. I say "might" because there's no definitive scientific proof but in theory, it helps. As long as there's no detrimental effect, I'm all about trying that stuff. As long as it doesn't cost an arm and a leg. 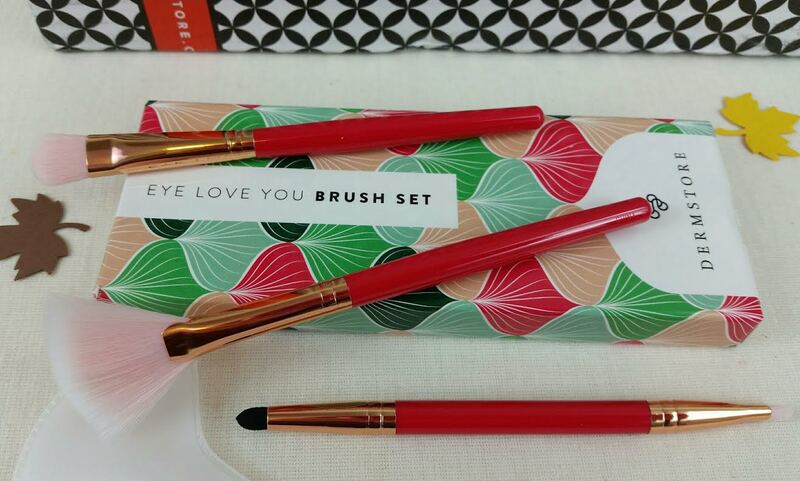 Dermstore Eye Love It Shadow Brush Set- A set of three shadow brushes. I don't recall ever seeing anything from the Dermstore brand in this box before except for their awesome lip balm. If you would like to sign up for BeautyFix, you can do that here. If you are a first time subscriber, you can get your first box for only $12.50! That's half off. This box is definitely worth that much. What do you think of BeautyFix? I have subscribed on and off (mostly on) for quite awhile now and they seem to either knock it out of the park or be sort of limp. Ooooh, a whole box of skincare! It's boxes like this that make me wish I lived in the US. Think of all the money you save, though! :D Skincare is always my downfall, I can't resist it!